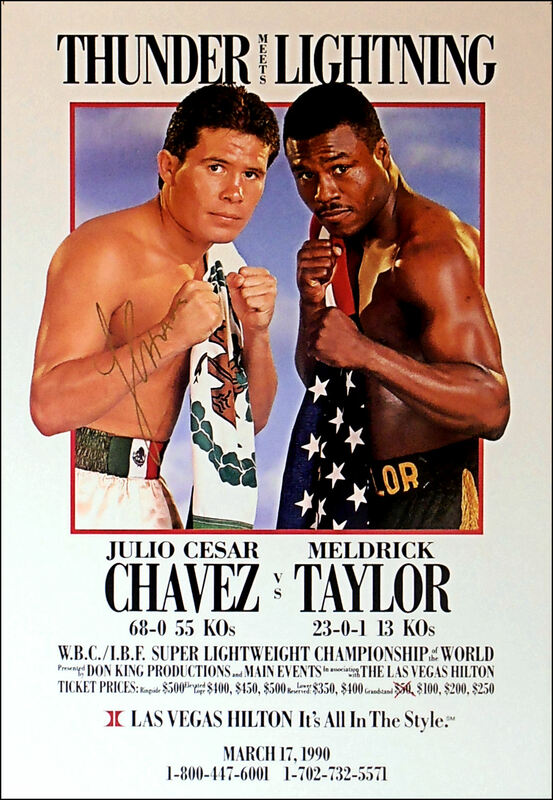 Description : Here we have an authentic Julio Cesar Chavez autographed super rare onsite poster from the Las Vegas Hilton for one of the most dramatic fights in history.......I WAS THERE! The place went absolutely nuts as all the Mexicans went ballistic with joy & so did I. I'm totally of the unbiased & common sense opinion that referee Richard Steels made the correct call! Meldrick Taylor was done! Regardless of there only being 2 seconds left! The referee is not a time keeper" 1st second of a round or last second of a round, if you are not able to defend yourself, then you are out, simple as that! Heartbreak for Meldrick for sure, but if he'd just danced away the last round he'd have taken Chavez's WBC title to add to his own IBF crown & history would have taken a different turn. 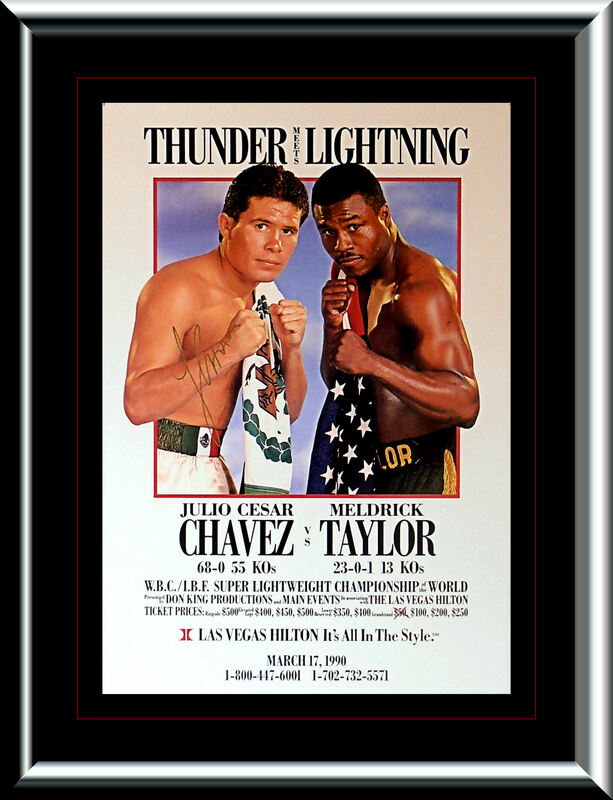 But his trainer Lou Duva told Meldrick he needed the last round & sent Taylor out to fight instead of boxing & with about 20 seconds remaining Chavez connected with a right hand that you could here over the roar of the crowd & Meldrick responded by firing back but got maneuvered into the corner by Chavez who then detonated that right hand onto Taylor's chin & down he went & the rest is history, as they say! 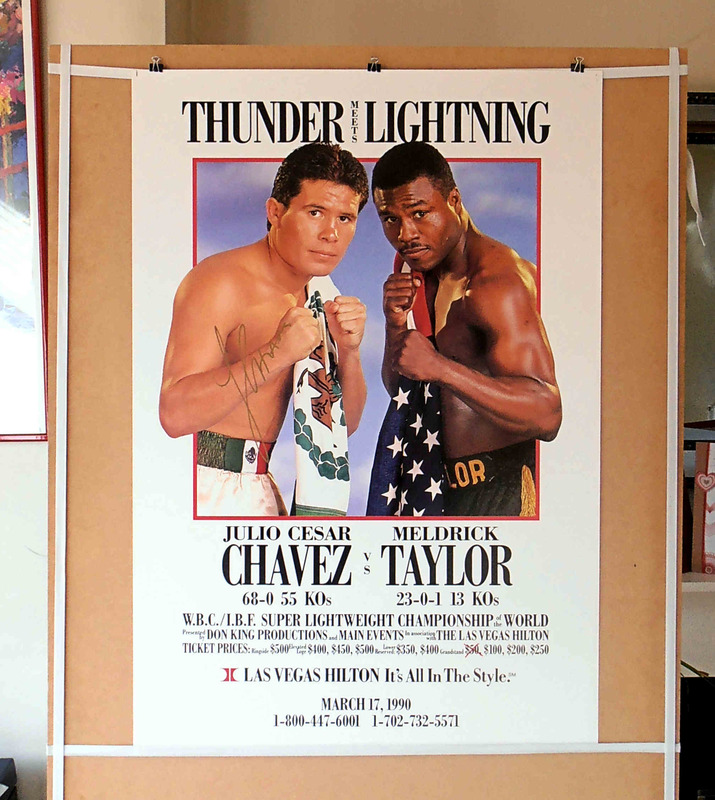 This authentic Julio Cesar Chavez signed onsite poster comes with a letter of guarantee of authenticity from KOfightposters.com for a lifetime & beyond. .
Postage: £10.00 Special Delivery... £20.00 International. Condition : Excellent / 4 pin holes / Framed 4 display purposes only!